All makeup removers are not created equal. 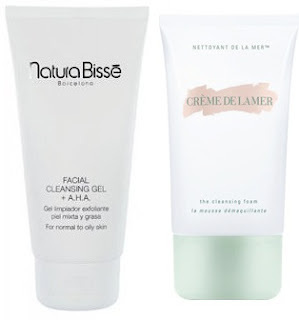 Cleansers are not necessarily makeup removers. There are many types of makeup and many types of makeup remover. Something that a lot of people don't know - that I also didn't realise for a long time - is that a cleanser is not necessarily a makeup remover. I use a cleanser in the morning to remove dead skin, toxins and the previous night's skincare products. I use a cleanser in the shower if my makeup is already removed. I use a cleanser on my "makeup-free day" (at least once a week) morning and night. Makeup removers, on the other hand must be good at removing every scrap of makeup from your face. What you use is down to your personal preference, your skin type and age, your budget and your skincare/makeup regime. In general, you need a heavier duty makeup removing cleanser to remove heavier makeup. If you don't wear heavy coverage or a full face of makeup, or waterproof products, you will be able to use a more gentle makeup remover. Similarly, f you have very oily skin, you will need to use quite a decent cleanser or makeup remover irrespective of the amount of makeup you wear (as you will want to ensure that you remove not just makeup but also excess sebum from your face). On the other hand, if you have sensitive skin, you will want to use makeup remover specifically formulated for your skin type. And for dry skin, you need to make sure you're not using astringent products. A cleanser can be a makeup remover - just make sure that it states it's a "makeup remover" on the packaging. And a makeup remover should be a cleanser, if it's good at its job. But one is not necessarily the same as the other. When choosing a cleanser, choose one for your skin type. So you need to know if you have combination/sensitive/oily/dry/acne-prone/congested skin; if you have any allergies or sensitivities to particular products; if you need to use a cleanser that doesn't contain alcohol (always a good idea); and then personal preferences - would you prefer if your cleanser didn't contain parabens, or if it didn't contain silicones, if it needed to be ph-balanced or if you need to avoid rinse-off cleansers for example. These generally follow the old-school cleanse-tone-moisturise regime and are used simply by applying all over the face, massaging-in, and removing with cotton pads, then following up with toner to remover the remains of the cleanser. I personally feel these can be great as a cleanser but not as a makeup remover. They require using a lot of cotton pads; I never feel I get all the makeup removed; I generally need to double-cleanse* to get rid of everything. So, I use twice the amount of product and/or another product afterwards, and a lot of cotton pads. (My mother, on the other hand, has always sworn by this method. Mind you, she eschews cotton pads and instead uses muslin cloths - but this does involve a lot of pulling and dragging at your face that's really not a good thing). I say "recommend" insofar as I use them when I have run out of absolutely everything else, or as a pre-makeup cleanse for a client with dry skin. To use these types of products, you'll need your cleanser, a toner, shed-load of cotton pads, (usually) a separate eye makeup remover, and a lot of patience. 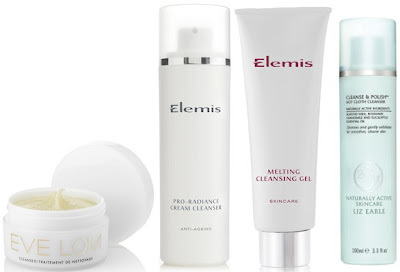 * Double Cleansing This involves, as is suggested, cleansing the skin twice. This can be a double-cleanse with the same product, or first of all with an lotion/oil/balm/cream -based makeup remover, then a wash-off cleanser. It's usually not necessary unless you are wearing extremely heavy makeup and/or have excessively oily or congested skin, as over-cleansing the skin can strip the skin. Oil-based cleansers are my personally recommended brilliant all-in-one product and can be used as a cleanser and a makeup remover. To use, pump some into the palm of your hand, then massage into your skin**, then wet your hands and massage your skin to emulsify the oil on your face, turning it milky, then rinse everything off with warm water, and/or a muslin facecloth. Generally, they remove absolutely everything, including stubborn eye makeup, so you don't need a separate eye makeup remover; your skin is soft afterwards and not tight or dry; there's no pulling or dragging of your skin; you don't need to use cotton pads. You can follow-up with a toner afterwards if you want or your skin needs it, but you don't necessarily have to, if you're using the right oil for your skin type. MAC, Lancôme, Origins, Decleor, L'Occitane, Kanebo, Kose, Shiseido all make oil-based cleansers also, but I haven't used them. Do your research first - some of these contain mineral oils, and it's better to avoid these types of oils if you have very very oily/acne-prone skin as mineral oils can be quite heavy on your skin. Contact Lens Wearers Very emollient or oil-based cleaners can leave a film on your lens (so, remove your lenses before using these types of cleansers). Balm or Melt cleansers are similar to oil-based cleaners and can usually be used to remove makeup, but pay attention to the instructions - some of them can be used on the eye area, and some can't. You generally start out with a small amount of a balm or thick oil/gel/cream -type formula which you massage into your skin**, and keep going until your hands have warmed it up and it starts to feel oily. Again, as with the oil-based cleansers, you then add some warm water, emulsify the product on your face, and rinse/gently wipe away with a face cloth. These have more or less the same benefits of the oil-based cleansers however I personally prefer to use a toner after these as they tend to be heavier in formulation than just oil-based cleansers. But perhaps that's just me. Liz Earle Cleanse and Polish - good at removing makeup but the muslin cloths that come with it are pretty much useless; replace with your own or a good facecloth. It's also not great for eye makeup. Most of the duo/dual/bi-phase cleansers that are available are intended for use in the eye area, however however Clarins do a One Step Facial Cleanser which can be handy to use as both a cleanser and (light) makeup remover. These contain two liquids, generally one water-based, and one oil- or silicone-based, which must be shaken before used to combine them, then used in the same way as a standard lotion cleanser, ie with lots and lots of cotton pads. 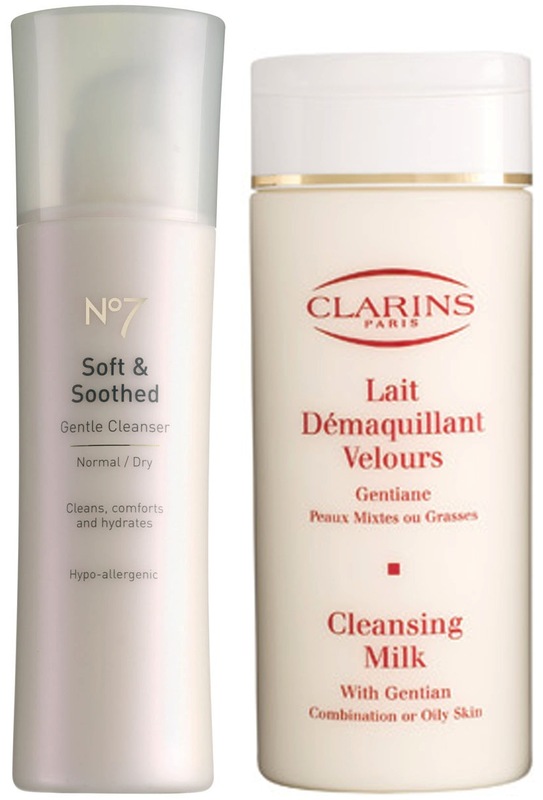 The idea behind these is that a toner is not necessary afterwards, but I find that the Clarins one, which is the only one I've tried, doesn't remove enough makeup to be any use to me, personally. Micellar water based cleansers are either an oil-suspended-in-water, or a water-suspended-in-oil solution which has the look and appearance of a water-based cleanser. These are technically therefore bi-phase cleansers, but I've given these a separate section as you don't have to shake them before using to mix the two liquids. These are wonderful as a non-makeup removing cleanser for all skin types, including sensitive skin. These can be used as a makeup remover if if you wear a tiny smidgen of makeup, but they are pretty much useless for removing waterproof makeup, or very heavy-duty foundation, or very long-lasting makeup, or silicone makeup. These, like the old school cleanse-tone makeup remover type require a lot of cotton pads. You simply douse a cotton pad in the solution, and use it to dissolve whatever gunk is on your face. Repeat until done. I find that they tend to dissolve makeup better than old school makeup removers however, and don't leave a film on your face, so you don't need to use toner afterwards. Bioderma Sensibio H2O (used to be called Créaline) - but it can be hard to get hold of. These are used by massaging a small amount onto damp skin and then removing with water. I alternate between two of these to cleanse my skin in the morning. These are great as cleansers but generally not useful as a makeup remover. Note that if you have dry skin, you may find that wash-off cleansers don't work particularly well, as they can dry out your skin somewhat. I also am using up my stash of Yves Saint Laurent Instant Pur Self-Foaming Cleanser which I did find good, however this has since been discontinued, and in addition it's got quite a heavy fragrance that woudn't suit everyone. It contains a lot of alcohol so not ideal for dry or sensitive skins and also contains "plankton extract" - I'm not a vegetarian, but I'm not altogether happy with this inclusion. Either way, it's since discontinued. If I were to pick just one product that would work as a more heavy-duty cleanser and as a makeup remover, across the board, I would recommend an oil-based cleanser (specifically Shu Uemura Cleansing Oil - there's one for every skin type). These cleansers are real work-horses, removing all makeup (water based, oil based, cream based, silicone based, waterproof, long lasting, you name it). If you have oily skin, oil-based cleansers help to break down excess sebum and dislodge blackheads. If you have dry skin, oil-based cleansers won't dry your skin out. If you have delicate or sensitive skin, you you won't be pulling or dragging with oil-based cleansers. In terms of value for money, you only use a small amount, you generally don't need a separate eye makeup remover, you don't need a small pile of cotton pads and you rarely need to bother with a toner (of course you can follow-up with toner afterwards if your skin needs it). 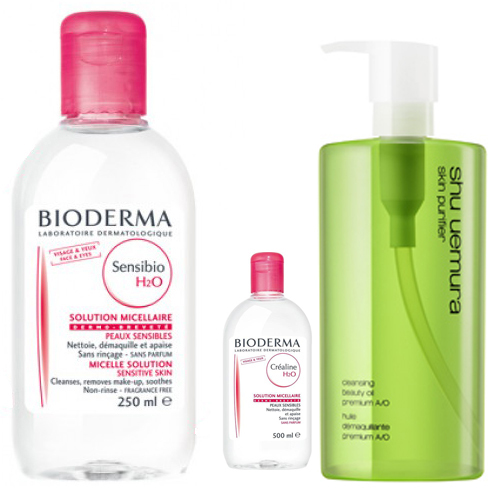 My second recommendation is a micellar water cleanser like Bioderma Sensibio H2O. This is great as a gentle morning cleanser for all skin types and will even remove light makeup, it doubles-up as a toner or as the second step of a double-cleanse, should you need to do this for very very heavy makeup on oily skin.